Inhalers are the mainstay of asthma treatment, where they reduce symptoms and save lives (Scullion and Holmes 2013), and in Chronic Obstructive Pulmonary Disease (COPD), where they reduce symptoms and reduce risk of death – although a definitive study on this has not been published. But do inhalers come with a cost to the environment? It is undeniable that all health and social care actions affect the environment, and the NHS has a large carbon footprint (King’s Fund 2019). Inhaler devices contribute to this carbon footprint, and more than 65 million are prescribed in the UK every year. 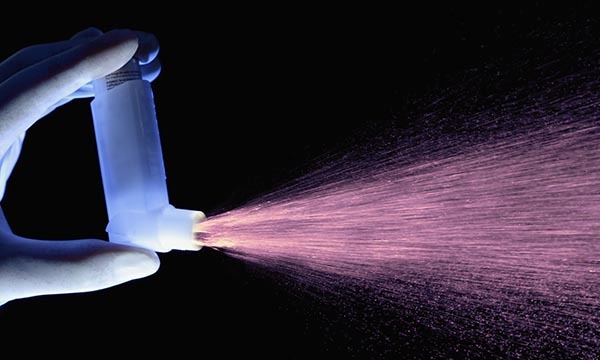 In the UK, the most used device type is the pressurised Metered Dose Inhaler (pMDI), followed by Dry Powder Inhalers (DPIs) and other types such as the Soft Mist inhaler. The propellant fluorinated gases (F-gases) used in pMDIs are cause for concern. These propellants are regarded as potent greenhouse gases with global warming potential, although companies are working on lower global warming potential propellants. The House of Commons Environmental Audit Committee's (2018) scrutiny of F-gases recommended a 2022 NHS target of 50% of prescribed inhalers to have a low global warming potential impact, one possible way do this is to increase the amount of DPIs to pMDIs prescribed. Unfortunately, the wording of many of these initiatives appears to indicate that ‘switching’ pMDIs to DPIs is the simple answer, but this needs careful consideration. A recent Lancet paper reminds us that athough DPIs may be ‘pharmaceutically equivalent’ in dose to pMDIs, they are not pharmacologically clinically equivalent (Usmani et al 2019). ‘Promoting’ a switch of inhaler to low global warming potential without considering the clinical impact is a cause for concern. Clearly the license for and medication in a device are important, but if the person is unable to achieve the necessary inspiratory flow rate for the device then it is a fruitless prescription. The National Institute for Health and Care Excellence (NICE) is consulting an Inhaler Decision Aid for use with patients to ascertain their views and guide their choices. But the caveat is that it doesn’t matter how much someone likes a certain device: if there is not a suitable option available, it’s not an option. The idea of simply switching to low global warming potential devices therefore has many ramifications. The CRITIKAL study shows that inability of patients in day-to-day life to effectively inhale from DPIs led to worsening asthma control and exacerbations in contrast to those using pMDIs (Price et al 2017). So, what’s the answer? The rule of medicine is ‘first do no harm’. Usmani et al (2019) discuss the possibility of reducing the climate change impact of inhalers through more general measures. These include addressing primary prevention, overprescribing of short acting beta agonists, promoting adherence, and healthcare professional training in device use. These should be considered alongside innovation in device efficiency. As inhalers contribute around 0.1% of a carbon footprint (House of Commons Environmental Audit Committee 2018), we need to be sensible. The worthiest environmental conscience in the world cannot compensate for correct inhaler use; ability to use is especially important when it comes to inspiratory flow rate. Disposal of devices also needs to be considered: how many are recycled and how many end up in landfill? All of this has an impact on the environment. Correct inhaler use is one of the biggest problems in asthma and COPD care. We need to educate and encourage regular treatment, while ensuring that, as important as it is, the environment cannot come before peoples' health. Price D, Román-Rodríguez M, McQueen R et al (2017) Inhaler Errors in the CRITIKAL Study: Type, Frequency, and Association with Asthma Outcomes. Journal of Allergy and Clinical Immunology Practice. 5, 4, 1071-1081. Usmani O, Scullion J, Keeley D (2019) Our planet or our patients – is the sky the limit for inhaler choice? Lancet Respiratory Medicine 7, 1, 11-13.